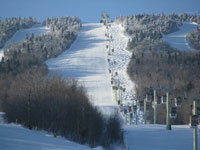 Stratton is a sprawling ski area, served by 4 – 6 pack chairlifts and a beautiful base to summit gondola . Stratton is the mee eting spot of sophisticated families from away, and it’s a great place to play whether you like groomed cruisers or glades and terrain parks. 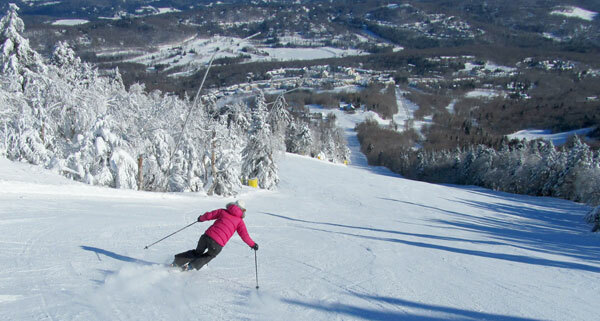 With swift lifts and beautifully groomed trails, Stratton is an ego-pleasing ski mountain. 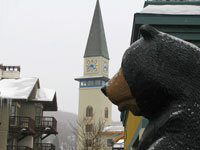 Stratton began welcoming skiers, wealthy winter lovers, in 1961. Now the Intrawest style village provides a plethora of mountainside lodging, an new improved base lodge for winter 2015 ($8.5 million), excellent children’s ski programs and some of the best terrain parks and super pipes in the East. In fact, Stratton hosted the US Snowboarding Open for years before it moved to Vail. Stratton has raised some top Olympic talent like Ross Powers and Kelly Clark. Stratton’s après ski gets a thumbs up too! Stratton is also one of the first New England Ski Resorts to require a terrain park pass before you can ski or ride in the Terrain Parks,with an online etiquette quiz and rules of the park as dictated by the Stratton SES Pass. Stratton’s European style pedestrian village offers an Irish Pub- Mulligans, an upscale localvore restaurant Verde, Table 43.1, a Sushi Bar, and several other cafes, pizzerias and pubs, and a great slope view from Grizzly Pub for après ski, plus shops like Bogner and North Face to keep you amused after the lifts stop spinning. Stratton is now under Aspen ownership, part of an Interwest buy out.